The Short Version: In terms of bringing people together, not many organizations do it better than HeadCount. The nonprofit’s goal is to use the love of music as a vehicle to promote participation in democracy. Since 2004, HeadCount has registered more than 500,000 voters through its network of 20,000 volunteers across the US. By partnering with musicians, concert promoters, and volunteers, HeadCount is inspiring people to get involved in civics and causes revolving around social justice. If you’re looking to change the world and meet fellow music aficionados and activists in the process, volunteering with HeadCount might be a way to go. Voting is a sacred right in the United States and the key to the survival of any healthy democracy. Throughout US history, citizens have protested to protect and expand this right, and more than one war has been fought over it. But, alarmingly, a third of American citizens who are eligible to vote aren’t even registered. In 1944, this was one of Franklin Delano Roosevelt’s primary concerns — even as World War II ravaged Europe and the South Pacific. “Nobody will ever deprive the American people of the right to vote except the American people themselves, and the only way they could do this is by not voting,” the President said in a radio address from the White House. Although the numbers seem to point to a general feeling of apathy in the modern body politic, grassroots organizations are working to light a fire under today’s eligible voters to encourage them to get involved. HeadCount is front and center in this movement. The organization employs a unique approach to inspire citizens to political involvement. By partnering with musicians, concert promoters, and thousands of volunteers, HeadCount looks to music to act as a call to action. 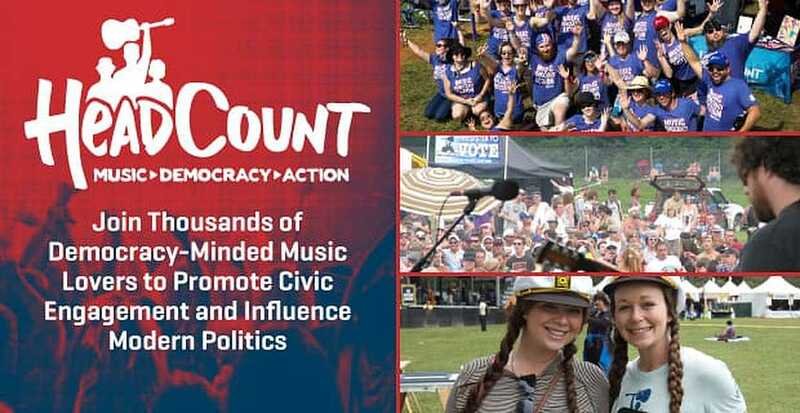 As a nonpartisan organization, HeadCount works with musicians to promote civic engagement. 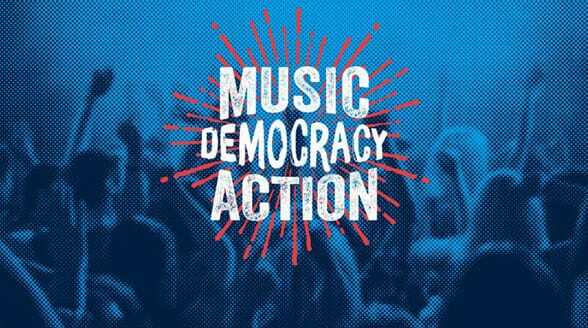 “We’re a national nonpartisan nonprofit that uses the power of music to engage people with our democracy,” said Aaron Ghitelman, HeadCount’s Director of Communications. And the plan is working. Since 2004, HeadCount has registered more than 500,000 voters. For those looking to better the world, HeadCount’s volunteer program delivers the perfect opportunity to enact change while connecting with a community of politically-minded activists and music lovers. HeadCount brings its organizational strength to collaborate with musicians, concert promoters, nonprofits, and volunteers nationwide. The organization has street teams of volunteers in every major city and has worked with a range of musical artists, including Jay-Z, Dave Matthews, Pearl Jam, and the Grateful Dead. HeadCount sets up shop at concerts, creates PSAs, and develops digital media campaigns to encourage people to get registered, get informed, and vote. HeadCount helps other civic-minded organizations make meaningful connections with more people. The nonprofit runs Participation Row social action villages at major festivals and tours. Volunteering with HeadCount is a great way to connect with other politically-minded music lovers. HeadCount is also a great way to meet like-minded people who are passionate about music and democracy for friendship or romance in a new, impact-making environment. Aaron told us HeadCount attracts people of high character who are concerned about world events and social justice. Tthose who volunteer become a part of a community on a mission to change the status quo and quash apathy when it comes to political involvement. 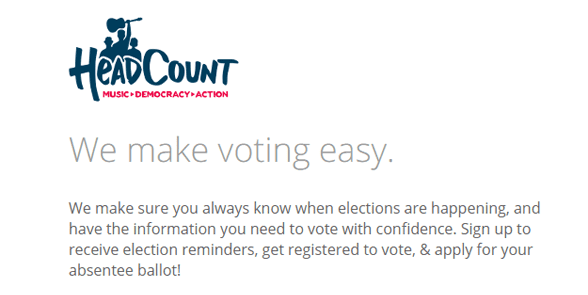 HeadCount’s goal is to make voting as simple as possible for citizens, and the organization has partnered with TurboVote as another means to do that. HeadCount now provides an online platform where voters can sign up to find out when local elections are happening. “We want to make sure people get alerts for all local elections,” Aaron said. “It doesn’t matter the size of the race — they’re all important. HeadCount partnered with TurboVote to further its mission to make voting easier. Once signed up, TurboVote sends election reminders, directs users to voter registration information, and provides the ability to apply for absentee ballots. Getting started is easy. The online application portal walks users through the sign-up process, asking for information such as name, email, and location. There is also an option to enlist in volunteer opportunities with HeadCount to help register other voters at concerts. It’s a great way to stay informed and be an active participant in democracy. HeadCount also coordinates several projects to build awareness and engagement in communities around the country. The organization helped create National Voter Registration Day, which is endorsed by the White House. More than 200 musicians, comedians, and celebrities took a picture with the HeadCount “Register to Vote” clipboards and shared on their social media with a link to online voter registration forms. This project has resulted in over 50,000 voter registrations and the campaign is still going strong. Thousands of volunteers throughout the US are giving their time to HeadCount to enact change. Music for Action is a wildly successful incentive campaign that offered a free “Best of Bonnaroo” compilation album in exchange for climate change emails to Congress. The campaign yielded over 100,000 emails, and participants enjoyed a gratis album with exclusive songs from My Morning Jacket, Wilco, Dave Matthews Band, and Pearl Jam, to name a few. Another campaign, created for Dispatch and State Radio, was so impactful it earned a Davey Award for web-based activism. HeadCount also partners with The Capitol Theater in Port Chester, New York, for the project Capitol Community. The partners run several charity auctions supporting local initiatives and causes selected by artists. Proceeds of past events have gone to several worthy organizations, including Sandy Hook Promise and Museum’s Summer Teacher Institute. To get involved, you simply place a bid online. It can’t be undersold that volunteers are everything to HeadCount. Aaron told us he holds volunteers in high esteem and admires the work they do for the organization. Volunteering for HeadCount doesn’t require a PhD in Political Science. The organization guides volunteers every step of the way. While it’s not the goal of the organization to help you find your soul mate, there is a particular kind of simpatico HeadCount inspires in the people it attracts. Successful relationships, whether romantic or platonic, are built on finding common ground. And that’s just what most find in HeadCount’s community. As the United States enters a year when everyone will have an opportunity to vote for representatives and other public officials, HeadCount is ramping up in response.